I was a competitive swimmer as a freshman in university. I would get up at 4:30 am for practice at 5:30 AM. Then I’d bike to the station and take the 1.5-hour train to school, try to stay awake in class, then bus back to the pool in the afternoon for evening practice. I would clock in about 20 hours of training in total every week. Somewhere along the way I found the time to study and I ended up finishing my freshman year with a 3.8 GPA. By my sophomore and junior years, I had retired from swimming so although it would seem like I had more time on my hands, they were disasters by comparison. In fact, I struggled with getting up for 8 AM classes, getting all of my schoolwork done and just keeping up with readings. If you struggle with getting all your homework done as much as I did, you’ll appreciate Ted’s story. Ted was a high performer who was also interested in a lot of different things: naturalism, boxing, body-building and dance. And yet, Ted excelled at Harvard: during his freshman year, he took seven courses and ended up with honour grades in five of them. Basically, Ted’s the guy you know who goes to every party, rocks the dance floor till the sun comes up, and still gets straight A’s in every class. Ted could do this mainly because of his work-hard-play-hard work ethic: he resolved to focus solely on his work during study sessions, so that he could let loose when he was done for the day. This strategy served him pretty well – he brought it with him even as he graduated from Harvard, went on to public service, and rose to become one of the most famous presidents the US ever had – Theodore Roosevelt. Roosevelt would begin his scheduling by considering the eight hours from eight thirty a.m. to four thirty p.m. He would then remove the time spent in recitation and classes, his athletic training (which was once a day), and lunch. The fragments that remained were then considered time dedicated exclusively to studying. As noted, these fragments didn’t usually add up to a large number of total hours, but he would get the most out of them by working only on schoolwork during these periods, and doing so with a blistering intensity. In essence, TR worked harder and smarter on his homework – not longer. And by the end of this post, you’ll be able to do that, too. This is a test-taking strategy from Barbara Oakley’s A Mind for Numbers – and it carries over perfectly to homework problems. Scan your assignment to identify some of the harder problems, then start in on those. If you’re stuck after a minute or two, disengage and jump over to an easier problem. After finishing a few of those, you can come back to the harder problem – and you’ll often find that it’s easier to solve than it was before. This technique works because of the fact that your brain functions in two distinct ways of thinking: focused mode and diffused mode. Focused-mode is when you directly concentrate on a problem and try to work through it logically. What that means is that to solve difficult problems, you need both modes of thinking. First, you need to work through as much as you can to “prime the pump” with focused thinking, before letting your mind relax and let diffused thinking do its thing. By using your technique, you’re allowing more parts of your brain to fire and help you solve a problem. 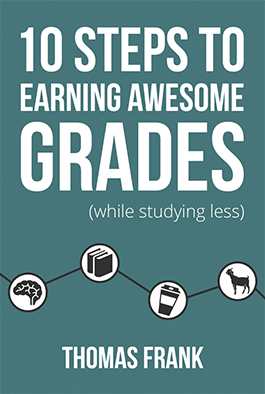 To be able to study well and feel confident, you have to have complete notes. There’s just no getting around that. But what if your professor is the type who rambles or talks too fast? 1. Record the problem and the answer first, before you write down the solution. The sample problems from class are the best way to make sure that you’re covering the right material when you’re studying for exams. This helps facilitate your studying after class because even if you don’t know exactly how to do the problem, you can always work backward from the answer. And if you get stuck, you can always get help from Google, YouTube or a friend. This note-taking technique work especially well if you’re falling behind during the lecture because your teacher talks as fast as Kendrick Lamar raps the bridge for DNA. 2. Annotate like you’re going to teach someone else. Every little piece of information helps when you’re working through a math problem and x suddenly seems to have morphed into a ninja turtle, somewhere between steps 1 and 2. Finally, you can also check out this comprehensive video for the best ways to take better notes faster. Here’s something your teachers never told you: homework isn’t actually supposed to be done at home. In fact, the best time to do your homework is when you’ve just come from class and the material is still fresh in your head. By doing your homework ASAP, you’re able to work through the problems faster, by reinforcing the concepts to yourself. Similar to how Theodore Roosevelt worked intensely between 8:30 am and 4:30 pm, either schedule a big gap in your day, or just stay on campus to finish homework before going home. Looking back on my own story, I realized that when I stopped swimming, I had become far too lax with my time and, in effect, spent more time in low-intensity, ineffective studying. I also realized that having such a rigorous training schedule forced me to focus harder during the little time I had to study between practice and classes. So to sum up, in class, use the problem-answer-solution framework to take good notes, even if your teacher talks really fast. This way you capture all the example problems you need to study. Then, use the Hard-Start-then-Jump-to-Easy technique to call on all the parts of your brain to help you solve homework problems. 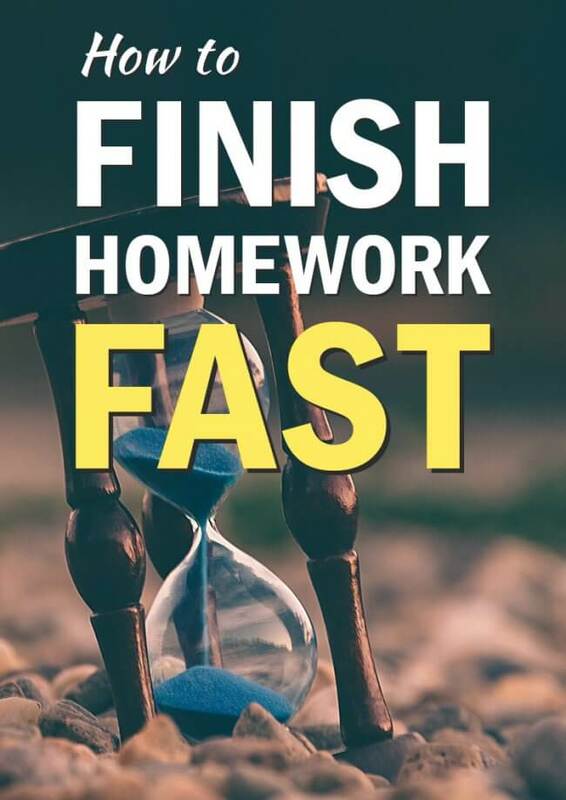 And finally, by doing your homework in school, you’re taking less time to study overall because you’re doing it with more intensity and intention.